On September 11 1973, the Chilean Army, backed by the CIA, staged a coup to overthrow and murder the country’s democratically-elected leader, Salvador Allende. Under the rule of a military junta led by Augusto Pinochet, the country became ‘an emblem of torture, cruelty and murder’. Trade Unions and other leftist organisations were ruthlessly supressed, with disappearance and summary execution routine. Even if the answer to questions about whether torture can be justified in the name of neoliberal economic policies seems self-evident, there is still the issue of how to deal with collective trauma on the scale which Chile experienced under Pinochet. For many years, there was silence around the extra-judicial murders carried out by the junta (although memorials to the disappeared have more recently been erected in Santiago and beyond), while members of that government have been reintegrated into society. An amnesty law passed by Pinochet in 1978, and still in force today, protected many human rights abusers, and while a number of prison guards and police officers have been convicted of torture, kidnapping and murder, many received minor sentences. In her essay ‘Architecture of Memory’, Larissa Wodtke discusses the idea of ‘difficult knowledge’ — the tension between narratives which promote reconciliation and positive outcomes, versus those which remind us of conflict, justice and the experience of victims. So far, research has been inconclusive as to the benefits of either approach. It has been argued that truth and reconciliation commissions put an unfair burden of responsibility on the victims of oppression, while psychologists now feel that debriefing in the immediate aftermath of trauma can actually be harmful. So how do we create narratives around such catastrophic social events? While underground magazines such as Araucaria offered outspoken dissent against Pinochet, Chilean exile literature often approached the country’s ‘historical crisis’ indirectly, through dense metafictional texts, or through the structure of crime fiction, as in the work of Ramon Diaz. It has been left to novelists who came of age in the immediate post-Pinochet years to address the issue head on: as Marco Antonio de la Parra stated in his essay The Generation of 30 (1990), ‘with all the blows that history has given us in the last two decades, perhaps the most affected generation has been theirs, those who today are 30 years old and were involved in the sandwich of failures on all sides’. Alia Trabucco Zerán is too young to be part of the Generation of 30, but her work continues this project of addressing the ‘sandwich of failures’ from a literary perspective. 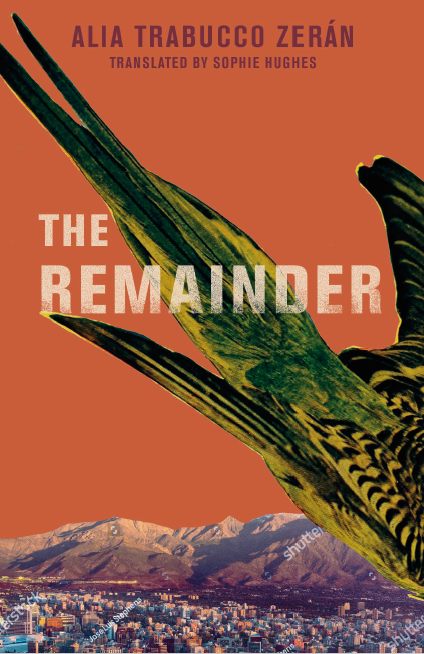 Her debut novel The Remainder, published in Chile in 2015, and now available in the UK thanks to And Other Stories, leans on magical realist traditions, but maintains the previous generation’s direct approach to addressing the legacy of Pinochet’s regime. The Remainder focuses on three childhood friends, the children of leftist militants, who are each coming to terms with their parents’ experiences. Each is haunted by the past; for Iquela, it is represented by her mother, an ex-militant, from whom she has never been able to gain any independence; Felipe, gruesomely, sees phantoms of the disappeared everywhere he goes, and feels compelled to maintain a running tally of victims. While these two experience trauma as a presence, for mutual friend Paloma, it is an absence; in an absurdist twist, the body of her mother has gone missing during its repatriation from Germany, and the three are compelled to go on a roadtrip across Chile to try to retrieve the corpse and somehow confront their pasts. The central tension of The Remainder comes from the conflict between Felipe’s need to label and catalogue, and Iquela’s desire to live in an unexamined present. This is called out and contrasted in the novel’s dual narrative structure: Felipe’s chapter headings count backwards, towards a goal of zero, while Iquela’s are merely parentheses, suggesting a wish to escape any form of linear progression. Although the two grew up together, they lack a mutual understanding: Felipe’s observation that ‘I never see pretty or bright or ordinary things, just as she never sees anything ugly or rare or important’ demonstrates the way in which even close friends are divided by the impact of Pinochet’s regime and its aftermath. For Felipe, Santiago is a charnel house; for Iquela, all this hard knowledge has been swept away under domestic routines. Paloma, whose parents were European, and who has spent her adult life travelling, is somewhat distant from her friends’ ongoing quarrel. For her, much remains unsaid about her mother’s attitude to Chile and how it was affected by her time in exile. The action of the novel takes place over a couple of days in which Santiago is covered in a rain of ash. The ash immediately transports the characters back to the day of the Chilean National Plebiscite in 1988, in which the people voted to decide whether Pinochet would be allowed to continue his rule for another eight years. For the children of militants, it was a period of barely-understood tension – all three attended a party at which their parents quarrelled nervously, listening to illicit radio broadcasts and asking ‘will the military even respect the outcome?’ For Iquela in particular, this was a formative day. Here, she first meets Paloma, an extraordinary looking girl who is marked out by her unusual, foreign pronunciation. Paloma proceeds to give Iquela her first cigarette, and first drink. They will come of age in a new country. Meanwhile, their parents argue, over a subject neither child can fully grasp. The gap between parents and children is crucial to The Remainder, and is most explicit in Iquela’s narrative. While she is unable to break free from her mother’s influence (‘I had enough savings to travel a thousand or so kilometres in any direction, but still the only road I’d ever taken in my life was the eight and a half blocks to my mother’s house’), the two have very little shared experience. Her parents had been members of a cell – ‘people with two names and two surnames’, as Iquela characterises them – and had necessarily kept many secrets from their children. Even after this need for secrecy had vanished, its effects were pernicious and long-lasting. The habit of secrecy is hard to break, and Iquela’s mother struggles to speak directly after years of adopting a coded language. It is this difference in vocabulary that Iquela feels most keenly: ‘to them a cover wasn’t a lid and a rat wasn’t a rodent’. In the present day, the ash cloud marks a similar moment of reckoning – the death of a parent here standing in for the democratic deposing of a President – and creates similar tensions. As the three friends realise that they are going to have to confront the reality of a body, they quarrel over strategies. For Iquela, this means finally facing what she has always tried to avoid; for Felipe, there is the question of what happens next, after the dead are counted and named. And for Paloma, how much of her identity is tied in to Chile, and how does she reconcile her experiences with her time in exile? Zerán’s subject is timely, and fits into a growing body of contemporary world literature examining such themes; Han Kang’s Human Acts and A Terrible Country by Keith Gessen similarly approach the topic of collective trauma, and, in the latter, the growing sense of alienation between generations who have lived through events and their children who have only heard of them second hand. There is a sense of the absurd which runs through the novel, in the vein of other And Other Stories publications such as The Adventure of the Busts of Eva Perón and Lightning Rods, without the narrative ever becoming slapstick. The Remainder is a bold literary approach to a national tragedy, which marks a growing desire to confront Chile’s recent history directly, acknowledging those ‘hard truths’. Posted in Book reviews and tagged alia trabucco zeran, and other stories, thom cuell. Bookmark the permalink.